Thinking of going to no-cooking for July. I'm tired of doing so many dishes every day and spending time over my stove! What are your favorite healthy, no-cooking (or little-cooking) recipes? I then remembered that I have a cookbook called No-Cook Pasta Sauces, and I went in search of a new recipe to try and to share with Rachel. I adapted their Shrimp Sauce with Basil, Mint, and Cilantro...taking out the sugar, adding some fresh garlic & red pepper flakes, and substituting some parsley for the cilantro. As with any recipe, switch out or leave out whatever you (or your kids) don't like. Try this with chicken instead of shrimp, add Sambal for a spicier kick, or substitute sesame oil for the sweet chili sauce. * This would be equally good over rice noodles, soba noodles, thin spaghetti, or rice. Soak the cellophane noodles in hot tap water for 15 minutes. Drain & run your hands through the noodles to get out all the water. Be careful not to over-soak them, as they will get mushy. Meanwhile, make the sauce by whisking together the lime juice, canola oil, fish sauce, chili sauce, garlic & red pepper flakes. 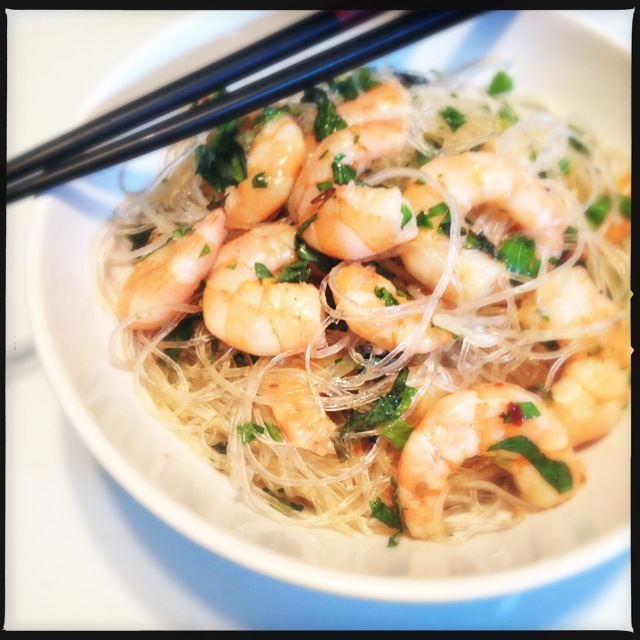 Toss in the green onions & cooked shrimp. When the noodles are soft, toss them into the sauce with the herbs. Serve immediately.